Dare to Mix Red and White Wine? Before reading further, please understand that wines like rosés are not just mixtures of red and white wines. They are made by a process similar to red wine, but the skins of the grapes are removed before they fully turn the wine a deep shade of red. (Read more about the process of making rosé wine in our previous post How to Choose a Great Rosé.) That said, some experimental wine drinkers delight in mixing red and white wines, producing curious concoctions that either intrigue or disgust (This is the adult equivalent of the way kids mix multiple sodas together at fast food restaurants). While purists will have no part in such playing, some wine drinkers delight in making their own mock blends of “signature” wines this way. Is it possible to mix red and white wines to create new blends of your own? Yes, it is. Will they be any good? While there’s no guarantee, if your palate is discriminating enough you may just very well be able to come up with a custom mix that suits your fancy (We can’t speak on behalf of your guests, however!). And while your blend will not be a real rosé, it may still exhibit an interesting, rosé-like appearance. Decide on the two wines you want to mix. Fill a glass halfway with whichever wine has the weaker flavor. Add half a shot glass full of the stronger wine. Sip, and see what you think. If the flavor is too weak, repeat to steps 3-5. If you’re lucky, you may have discovered a personalized blend you’re absolutely crazy about. Then again, you may have Frankenstein’s monster on your hands! If so, discard your glass and use a wine preserver like the Napa 4- bottle wine dispenser to keep the unused, untainted portions of your two opened bottles fresh for another time to be enjoyed on their own! Good luck, and happy mixing! Ever have a really good glass of wine you’d like to savor forever? If not forever, how about one you’d want to keep around to sip on over the next few weeks? We’ve all had those magic bottles of wine we wanted to keep around for little tastes, but couldn’t preserve adequately for more than a few days. With the WineKeeper 3-Bottle Executive, however, the game changes! 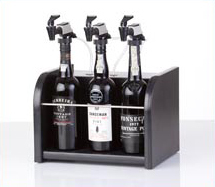 Designed to elegantly display three wine bottles, the WineKeeper 3-Bottle Executive keeps your wine chilled, ready to dispense, and well-preserved for weeks! Now, you can keep that “magic” bottle around to savor! 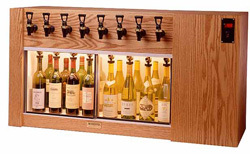 Available in a modern black or traditional oak finish, the WineKeeper 3-Bottle Executive can easily match your kitchen or wine room decor. Lightweight (12 lbs.) 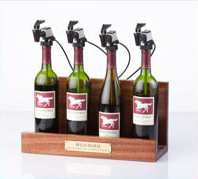 and easy to move, the WineKeeper 3-Bottle Executive uses easy-to-replace Argon or Nitrogen canisters. 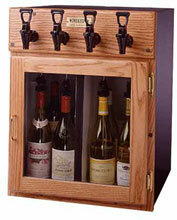 It makes a perfect, portable wine dispenser at parties, as well as at home. Don’t let that good bottle of wine go to waste! 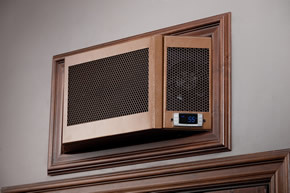 Keep it fresh and chilled with the WineKeeper 3-Bottle Executive. Ever drink a glass of really good wine and find little crystals at the bottom? These are “wine diamonds,” not sediment, and they have been helping to preserve your wine! Potassium hydrogen tartrate is a byproduct of winemaking. In cooking, it is known as cream of tartar. Wine diamonds are, in actuality, potassium bitartrate crystals that sometimes form on a wine bottle’s cork, most often when chilled. During the winemaking process, itself, they naturally form on the sides of fermentation tanks. They can be found in both red and white wines, and do not in any way mean that there’s a problem with your wine. In fact, when present, they help lower the pH, making a hostile environment for many types of bacteria that can spoil wine, helping to preserve wine after fermentation. The majority of winemakers, however, have gone to great lengths to eliminate these crystals from their bottles. (Mostly, this is a reaction to complaints about the harmless crystals.) Very cold stabilization before bottling (usually between 2 or 3 weeks) is a “solution” that brings these tartrate crystals to the fore, allowing them to be easily filtered from the wine which is then warmed back up. If you do find wine diamonds in your wine, your wine was probably made very naturally, and this is a good thing! Also note that consuming the crystals will not harm you; these wine tartrate crystals are the very same ingredient in the cream of tartar you used for baking the other day. They’re also used in a bunch of other foods and nonalcoholic drinks. It so happens that wineries are the only commercial sources for tartrates, and they often collect and sell wine diamond deposits that form in their tanks. So, the next time you see a few crystals at the bottom of your wine glass, know that they have occurred naturally, are nontoxic, and that they have helped to preserve your wine. Cheers!